Tranquil, serene, peaceful...Peppers Clearwater Resort is a dream luxury vacation destination situated on premium lakeside property. 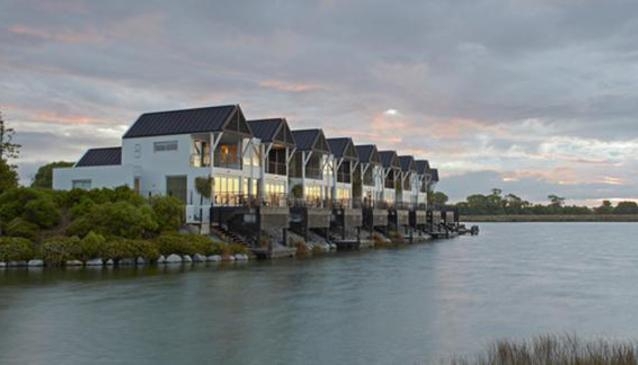 You won't believe that a resort so beautiful and calming could be a mere 15 minutes drive from Christchurch city centre. Peppers is designed to resemble a contemporary boathouse, and the views are simply marvelous. The resort is also home to the championship golf course of the New Zealand PGA. There are a variety of splendid rooms, suites and villas that offer guests a haven from the rush of everyday living. The dining establishment provides sumptuous meals in elegant surroundings. This postcard perfect setting also offers world class leisure facilities including tennis courts, spa therapies, fishing and golf. Its conference facilities are some of the finest that Christchurch has to offer.